Every time you venture out onto the road, you risk the experience of being in a motorcycle accident. Over time, situations become more common than others. In the realm of motorcycles, there are certain situations that riders should be on the lookout for, as they are the top seven most common motorcycle accidents. Sometimes the cause of the accident is the motorcycle itself; unfortunately, more often than not, the other car is to blame. Whether the factors exist to an inattentive driver, a vehicular error, the environment or even yourself, the fact is that the risk exists. The best you can do as a motorcycle rider is to prepare yourself for these situations so you may know what to do in these events. The most common motorcycle accidents occur in events when a vehicle turns left in front of the motorcycle, opens the door in the way of oncoming traffic, or even switching to the lane of the motorcycle while oblivious to the motorcycle’s existence. Other motorcyclists are also at fault in common accidents, as well as the environment of the road or abruptly locking the front brake. When any of these factors exist, the risk is increased. Preparing yourself by any means now can protect you later. As the primary cause of motorcycle accidents, cars turning left in front of the motorcycle cause collisions due to the lack of attention on the part of the driver of the car. Whether the cause is due to blind sports or distraction, this is a moment when you as the rider and driver of the motorcycle take control. Look for the signs that my forecast a car about to turn, and slow down or avoid accordingly. It also helps to be aware of the cars around you. Are you driving in any of their blind spots? If so, you are putting yourself in danger and should do the best you can in staying in sight of the drivers around you. This is another situation in which you must be aware of the possible blind spots you may be driving in. If a car is planning to move into your lane, they may put on their directional light before they move; however, it is more than likely you will have no such luck. Most drivers will not use their directional light. For such a situation you must prepare. Slow down if the car moving into your lane has their directional light flashing or if they are moving slowly enough for you to prepare. If they are making a sudden turn, however, try to maneuver yourself out of their way as safely as you can. Looking for the tell-tale signs of a driver wanting to switch lanes can help you recognize when to move out of the way of potentially dangerous situations. While taking a hit from behind, a car only ends up with a fender bender. In a motorcycle, the rider may face worse circumstances, even possibly fatal ones. A fender bender may be the most common auto accident. Its potentially fatal circumstances for motorcyclists mean that you will need to be on the lookout when you stop. One way to avoid this kind of collision is to step towards the outside of your lane, If you stop towards the right of your lane, you will be giving more space for the car behind you to stop. Be prepared to get out of the way even further if the need arises. Learning how to handle your front brake until it becomes second nature should be that first thing you do after you buy your motorcycle. If your front brake and its use is not a normal process for you, you are only putting yourself in danger. If you clutch your front brake too abruptly, not only could you damage your bike; you could damage yourself after flying over your handlebars. Practice with your brake if you are not used to it. The more you practice, the better your chances are of not reverting to an abrupt stop when better options are available. Always be prepared to make an unexpected stop in case you need to. Sometimes, it is no one’s specific fault that an accident occurred. One of the most common causes of a motorcycle accident is the weather and the condition it creates on the pavement of the road. Rain, snow, hail stones, even fog can create a dangerous environment for any vehicle, including motorcycles. Rain and water can cause the road to become wet and slippery. While Florida itself does not have to worry about snow, the state’s rainy season can become a hazard to any driver. Keep an eye out on the weather forecast and do not plan a ride in hazardous weather. If you are on the road when dangerous weather begins, stay off of the road for as long as possible, or until the road is safe to drive on again. Unfortunately, some people do not pay attention to their surroundings before opening the door of their parked car. Other times, motorcyclists will not take into account the opening of doors and may drive right into the door that just opened. To both the driver of the car and the motorcycle, pay attention to your surroundings. Think critically about situations before the consequences occur. Do not ever attempt to ride between a busy lane and an area of parked cars. Besides doors opening, there may also be pedestrians you could possibly hit. Play it safe and do not even attempt to drive past parked cars. Even if you may be following all of the rules of the road, at the end of the day, you cannot control the actions of others. 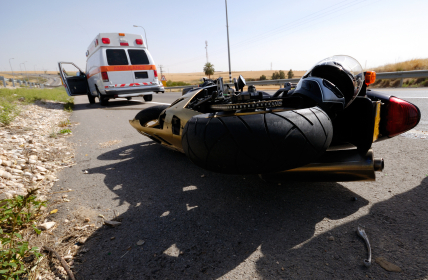 Another common motorcycle accident is that which includes another motorcyclist. Someone else may be daydreaming or distracting or caught in the moment of the wind in their face that they might not even notice the event for which they need to stop. When you are in a group, keep a sharp eye on the lookout, and only ride with motorcyclists in whom you trust their judgment or experience. Understand riding etiquette and discuss the preparations necessary for riding in a group. As a driver, it is your responsibility to prepare yourself for whatever may happen. There are so many different ways that an accident can occur; it is best to prepare for them all. A great amount of factors in any given order can lead to an accident. When you are riding in a vehicle, you are surrounded by an outer structure; while no vehicle is completely safe, there is no such structure surrounding you while on a motorcycle. Defensive driving and protective driving are two ways to protect yourself on the road; the third is preparation. Create an escape route that changes in accordance with the flow of traffic around you, and plan ahead for any of the situations listed above. When on the road, you only have control over your decisions, and it is in your interest to the decisions that best keep you safe. Immediately look out for your own safety in the event of an accident. Get in touch with the other party and trade information. Take pictures of any injuries to you or damages to the car. Make sure the pictures are complete with a time and date stamp. Always report your accident and take the steps as needed. Know your motorcycle, know your environment, and know yourself. Familiarize yourself and prepare for whatever will keep you safe on the road, for safety is your primary priority.